Learn how to get started in enabling small-space video conferencing, as GoToMeeting explores in this sponsored post. Huddle rooms continue to rise in popularity in the workplace. This is largely due to shifts in the way that people meet and get work done, according to Ira M. Weinstein, a leading analyst/consultant with Wainhouse Research, who was the expert speaker in our recent webinar sponsored by GoToMeeting. The "old-school way" of getting work done involved scheduled meetings with people congregating in a single formal meeting room space with a defined format. The meetings of old were aimed largely at disseminating information and informing the work staff of an issue. Fast forward to today, the "new-school way" is decidedly more ad-hoc, with small teams branching off to huddle up in less formal spaces, with both in-person and remote team members. The meetings of today won't necessarily have a defined leader or agenda, but rather consist of open discussion among team members who are trying to solve a problem together quickly, as Weinstein explained in the webinar. "This is a massive change in how we meet and how we work," Weinstein said. "... it's caused a change in the places we meet." To put this into perspective, Weinstein shared research that shows there are between 30 and 50 million huddle rooms in the world today, which compares to about 10 to 15 million medium and large meeting rooms globally. Clearly, the huddle room's appeal has led to its rise in the enterprise. With this shift underway, enterprises need to get ahead of this trend and understand how to implement and support huddle rooms for their workforces. So what exactly is a huddle room? As Weinstein defines them, huddle rooms are not just smaller meeting rooms; they are informal places where we go and get things done. And while a more fully integrated meeting room could have up to 30 functions, with huddle rooms the key functions are relatively basic, consisting mainly of audio conferencing, content sharing, and video conferencing. Huddle rooms should also be easy to purchase, deploy, and use, Weinstein said. Ideally, they will be powered by a single device with a single user interface and won't require a high degree of management as they are mean for on-the-fly meetings. Of course, video conferencing is an important element of the huddle room. In a Wainhouse Research survey of video conferencing users, 91% of users said they use more video conferencing today than they did last year. "Quite frankly, video conferencing is more important and we have more companies depending on it than ever before," Weinstein said. To learn more about huddle rooms, including the benefits of using software-based video in these huddle rooms and best practices for AV and video-enabling huddle rooms in your organization, tune in to the full expert analyst webinar, "Huddle Up! 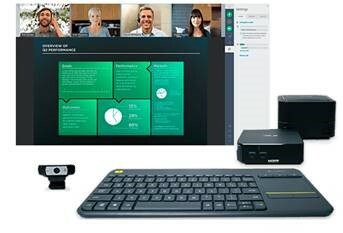 Get Started on Small-Space Video Conferencing," now available for viewing on demand. Watch it now and discover the ins and outs of huddle rooms for your organization!